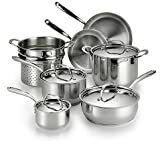 Cuisinart MCP-12 MultiClad Pro Stainless Steel 12-Piece Cookware Set is designed for professional home chefs. The cookware set contains every tool you might need for preparing a perfect meal. It includes two saucepans, two skillets, a sauté pan, a stockpot and a steamer insert. This cookware set features pure aluminum body, and brushed with a stainless steel finish which makes it the fastest heat conductor and the most even thermal distributor in the kitchen. The tri-ply steel finish is well-known for its durability, classy look and resistance to chip, peel or any other kind of stain. The MultiClad Pro Cookware Set comes with tight-fitting lids that seal in flavors and nutrients when you are cooking. The whole 12 piece set performs amazingly thusmakes cooking more interesting and yielding professional outcome. The stainless steel exterior gives the set a very appealing look; the interior is also made of stainless steel for optimal performance. The stainless steel cooking surface does not react with any food or natural flavors. This cookware gives you the opportunity to enjoy a fine art of cooking, and you get the best results. Heat is effectively distributed to the side walls and the bottom of the cookware, and this eliminates the chances of hotspots. It provides with even distribution of heat when making your meals. The aluminum core also ensures that there is even heat retention making you guaranteed of the best results. The cookware has handles that provide a professional style and maintain a controlled grip. The covers are made of stainless steel and seal in food nutrients to achieve a flavorful and healthier dish. This cookware is very effective for cooking techniques such as searing, browning, frying and simmering delicious meals. The lids fit tightly and seal perfectly bringing about very tasty dishes. The rims are tapered to bring about drip-free pouring. They are well designed for perfect pouring; therefore, you will not experience any dripping when you are pouring from the cookware. This is important because you will not get any food particles poured into your kitchen making it dirty. You do not have to worry about cleaning this set; the cookware is dishwasher safe. You will not experience any problems using your dishwasher to clean this set of cookware. Another important thing is that the cookware comes with a limited lifetime warranty. Q: Can I use this cookware for induction cooking? A: Yes you can; the cookware is constructed of MultiClad copper and steel, making it appropriate for induction heating. Q: Can the pans be used on a ceramic stovetop? A: Absolutely, I have this set for my home, and it has ceramic cooktop. It is important to ensure that the heat is not up very high. Q: What is the difference between Cuisinart Chef’s Classics and Cuisinart MultiClad? A: MultiClad has stainless steel over the aluminum making it heavier and thicker. On the other hand, Cuisinart Chef’s Classics has an aluminum base but not up to the sides. If you want to prepare your dishes like a pro, with every tool required to make your recipe perfect, consider purchasing this 12-piece cookware set. Each piece is molded to perform specific duties and fit given cooking capacities. This cuisinart multiclad pro review Cookware set is highly recommendable for professional and classy home chefs. 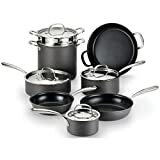 The stainless steel finish makes the set able to cook perfectly without reacting with any food substance or additives.